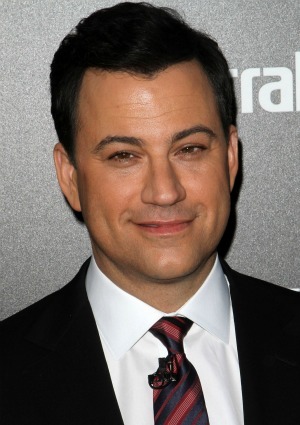 Jimmy Kimmel will host the 2012 Emmy Awards. Will the talk show host be more David Letterman at the Oscars or Ricky Gervais at the Golden Globes? Late night talk show host Jimmy Kimmel has nabbed the coveted spot as host of the 64th Annual Primetime Emmy Awards — but don’t expect anything close to the snarkiness delivered by Ricky Gervais at the Golden Globes. Don Mischer, who will executive produce the show for a record 12th time, confirmed the news — and slid in a subtle line about his comedic expectations. “We love television and look forward to working with the Television Academy and ABC in creating a show that is fast-paced, humorous, unpredictable and at times irreverent, but clearly celebratory of our incredible industry,” Mischer said in a statement. This is not Kimmel’s first foray into award show territory, though. In the past he has led both the American Music Awards and the ESPY Awards — plus, in April he will get to practice his schtick as host of the White House Correspondents’ Dinner. “I hope to be able to do for the Emmys this year what Eddie Murphy did for the Oscars,” Kimmel deadpanned in a statement. You’ll have to wait a while to see this happen, though: The 64th Annual Primetime Emmys don’t air until Sept. 23, 2012 on ABC.